To round out our series of reviews on the best travel rewards portals, we’ve put together this review on the Citi ThankYou Rewards Portal. For now, we are covering the various reward credit cards that will help you earn Citi ThankYou points, as well as the travel partners you can use to redeem them. Come back in the future to see the full, in-depth review! This should help you plan out any potential future trips if you need to know where to earn reward points! What is Citi ThankYou Rewards? Citi ThankYou is the bank loyalty program offered by Citi for using eligible credit cards on purchases to earn points. Citi ThankYou Rewards is the bank loyalty program offered by Citi. You collect Citi ThankYou points which can be used for a number of rewards, including on Amazon, Best Buy, Live Nation, for gift cards, statement credit, and especially travel rewards! To sign up for the program, you must be approved for one of the Citi ThankYou credit cards. As soon as you have your new card and make your first purchase, you will begin earning points. Depending on the category, you may earn bonus points, though cards always earn at least 1x points per dollar. You can manage your reward credit cards from the Citi online credit card portal, seeing your expenses and pay your balances. To manage your rewards, you need to go through ThankYou.com. Citi ThankYou points standard worth is $0.01 each. You get this value when you redeem for gift cards, shop with points, or use statement credit. However, when you have the Citi ThankYou® Premier Card (Learn More) or Citi Prestige® Card, you will earn a 25%+ bonus on your points when used in the Citi Travel Center (ends 9/1/19). Even better, you can get $0.015 to $0.02 per point when you transfer points from Citi ThankYou to one of the Citi transfer partners! Points will not expire as long as you keep your accounts open, though certain types of points, like shared points, come with an expiration date of 90 days. If you close all of your ThankYou accounts, you will have 30 days to use your reward points before they expire. You can earn Citi ThankYou points in many different ways. These include using credit cards, travel purchases, and banking relationship opportunities. To open a ThankYou Rewards account, you will need to apply and be approved for one of their ThankYou travel rewards credit cards. Citibank has 5 different reward program cards that earn points. Each one has slightly different bonuses and a different earning style, so it’s best to choose the one that fits your own spending habits. To apply, click on any of the card images or links below to complete a Citibank credit card application. You will be on your way to earning some great Citi travel rewards! The best way to earn the most points is by combining multiple cards so you hit all the available bonus categories. Citi has a unique earning category not available on most cards: entertainment. If you’re a big movie-goer or spend frequently on other entertainment events, these may be the right cards for you! The Citi ThankYou® Preferred Card is the most basic card in the lineup. Cardholders will earn 2x points on dining and entertainment, as well as 1x reward points for all other purchases. Dining covers all restaurants in the cafe, bar, lounge, and fast food categories. However, it may not cover specialty stores, or restaurants within other establishments that are not themselves categorized as a restaurant, such as a grocery store. Entertainment, however, is the category to be more interested in here! This category covers live entertainment, live theater, concerts, sporting events, movie theaters, amusement parks (including things like zoos), tourist attractions, record stores, and on-demand internet streaming like Netflix and HBO Go! Perhaps the best part is that this card has no annual fee! Note that your points never expire, and you have no limit on earning for any of the Citi ThankYou cards. Second in the line of the Citi ThankYou cards, the Citi ThankYou® Premier Card (Learn More) earns 3x points per dollar spent in travel and at gas stations. “Travel” is similar to the Chase Sapphire Preferred® Card travel category, in that you earn for airlines, car rentals, hotels, travel agencies, public transportation (railways, taxis, etc. ), cruises, tolls, parking…but this card also includes gas stations! On top of that, the Citi ThankYou® Premier Card (Learn More) earns 2x points in dining and entertainment as well. The annual fee is $95, and it is waived in the first year. The premium card in the line up is the Citi Prestige® Card. While this card carries a large annual fee of $495, it has some outstanding benefits. In fact, the card works like a combination of the American Express® Gold Card and The Platinum Card® from American Express. You will earn 5x reward points on airlines and dining, 3x points on hotels and cruise lines, 2x points on entertainment (ends 9/1/19), and 1x points for all other purchases. In addition, you will also have access to a range of luxury travel benefits. These include a $250 air travel credit, $100 Global Entry fee credit, and a complimentary night at a hotel after a 4-night stay (limited to 2 uses per calendar year from 9/1/19). This is definitely one of the great travel rewards card! The AT&T Access Card from Citi earns 2x reward points per dollar for all AT&T purchases, 2x points for all online purchases, and then 1x points for all other purchases. Most interesting is the online purchase category, since this is another unique category not offered on most other credit cards. Online purchases that count in this category are those in the online retail and travel website space, which doesn’t cover everything…but it does cover a lot! There is no annual fee on this reward credit card. Hot Tip: Points work like Chase Ultimate Rewards rather than AMEX Membership Rewards, your points do not “pool” together automatically and are not all worth the same amount. Instead, you must combine points within the Citi ThankYou portal, or use points individually. However, there are other options for redeeming points as well including gift cards, through Best Buy, Amazon, Live Nation and more. When you use the Citi Travel Center, it works similarly to the Chase Ultimate Rewards travel portal. You can search for flights and book them using your Citi ThankYou points. How much the points are worth depends on the card you use and the airline. For the Citi Prestige® Card, your reward points will be worth 33% more for booking flights ($0.013 per point), and just $0.01 per point for all other redemptions. Compare this to the $0.01 redemption rate for flights through the Amex Travel Portal and $0.0125 in Chase Ultimate Rewards. Also, Amex Travel only offers $0.007 per point when used for anything non-flight related. Citi ThankYou® Premier Card points (Learn More) are worth 25% more when redeemed through the Citi Travel Center for flights, hotels, and rental cars ($0.0125 per point). Note this is different than the Citi Prestige® Card, which only offers bonuses for flights. Finally, points on the Citi ThankYou® Preferred Card, and AT&T Access Card from Citi are all worth $0.01 each within the Travel Center. Travel partners are where you can earn the most bang for your buck. Points transferred to partners can typically be redeemed for at least $0.02 each (or more), making them quite a bit more powerful! One thing to note is that the variety of travel partners covers all 3 major airline alliances: Oneworld Alliance, SkyTeam Alliance, and Star Alliance. What this means is that you can basically use your reward points on any airline in the world! You will simply need to know how the whole redemption process works. In a nutshell, as long as you have miles within an airline alliance, you can call and have them book your award travel in available space on any alliance member’s flights! More importantly, this means that even though some of the big U.S. carriers are not direct partners, you can still use your points on American Airlines, United Airlines, Delta Air Lines, and more by transferring points to travel partners. There are some disadvantages of booking through partnerships, most notably reduced availability and additional taxes and fees (especially when using Asia Miles and Etihad). As long as you plan ahead and do research, however, you will be able to get the flights you want! In addition, Asia Miles and Etihad Guest are 2 more alliances in which you can utilize transferred points on a number of airlines. Asia Miles has 25 partners and Etihad Guest has 8 (including Etihad itself, which is its own airline). Note that Asia Miles is not an airline, and is just an alliance like the big 3 listed above. Also note that the 8 main partners of Etihad give you access to even more airlines via codeshares! For both alliances, there is no additional transfer of points necessary, but rather award availability based on award charts. 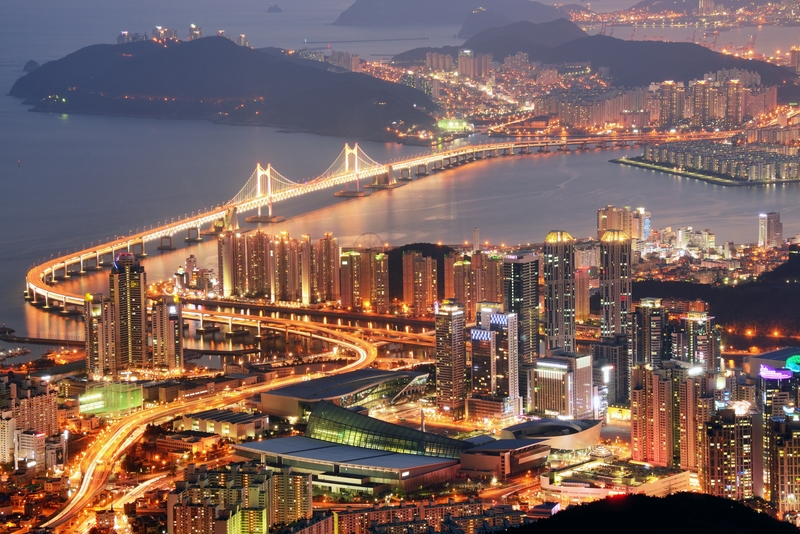 See the Asia Miles Award Charts and the Etihad Guest Award Charts. 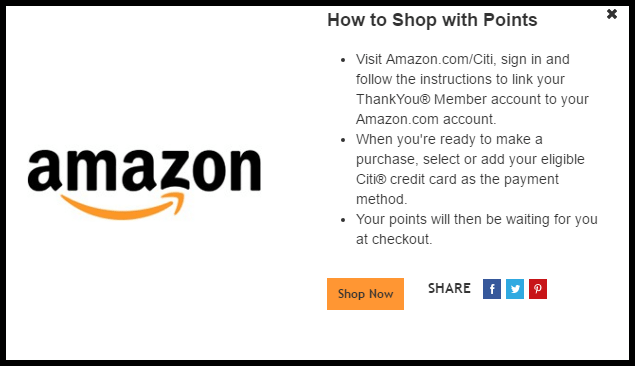 Use your Citi ThankYou point to shop directly from Amazon.com on millions of products! You can use your accumulated Citi ThankYou points right on Amazon.com. To do this, you must visit Amazon.com/Citi, sign in to link your Citi and Amazon accounts together, then add your Citi ThankYou card as a payment method. The next time you go to purchase something and choose your Citi ThankYou card as payment method, your points balance will appear and you will be able to offset your purchase with the points earned. Your points are worth $0.01 each when using them on Amazon.com. Link your existing or create a new Live Nation account with Citi ThankYou and you will be able to use your points at checkout! 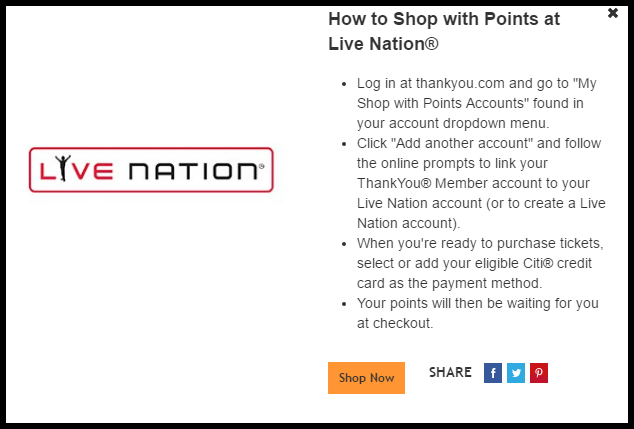 For Live Nation shopping, you must first sign into your Citi ThankYou account, find the “My Shop with Points Accounts” and “Add another account”. From there, you will be able to follow the prompts to create a Live Nation account, or link an existing one to your card. When you’re ready to purchase tickets, you just need to add your Citi ThankYou card and you will see your available points balance for payment. Points are worth $0.01 each. Add your payment information on BestBuy.com and you will see the available ThankYou points, which you can use to offset your purchase as a statement credit. Go to BestBuy.com and enter your Citi ThankYou card when you are done shopping and ready to check out. The shopping cart will prompt you with the available points that you have, and you can use points to offset the balance. 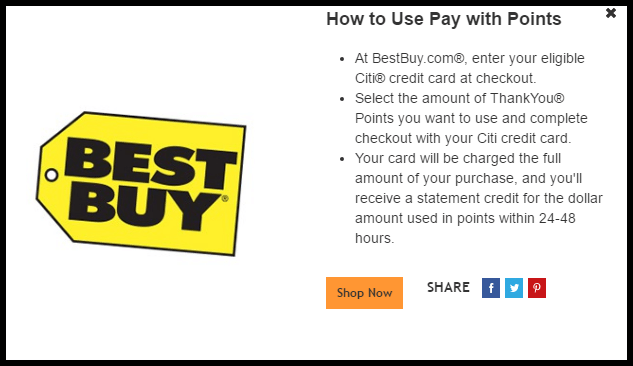 The way it works here is that Best Buy will charge the full amount to your card, and then Citi ThankYou will give you statement credit based on how many points you want to use. The statement credit can take 24 to 48 hours to complete. Reward points can be used at $0.01 each. Home Depot offers gift cards from $25 for your Citi ThankYou points! To purchase Home Depot gift cards with your point balance, visit this link and select the type of gift card you want: $25, $50, or $100. If you are signed in, you may see different options depending on your points balance. Gift cards offer a $0.01 per point redemption rate. If you’d prefer to directly use your points as statement credit, you can do so from the Citi Online area. Log in, select “Use Your Points Now”, select your eligible purchases, then select “Redeem”. Your points will be worth $0.01 each. Share your points with other Citi ThankYou members in order to offload unused or unwanted points! To share points with other Citi ThankYou members, log in to your account and find the area to share your points. You will need information about the person you are sharing with! Citi ThankYou is a very powerful program, which allows you to earn reward points that can be redeemed on nearly any airline in the world. The caveat to Citi ThankYou is that each of its reward credit cards earns points individually, and they cannot be combined until they are transferred to a travel partner. But the ThankYou credit cards are all excellent credit cards with unique bonus categories that will allow you to fill in even more gaps in your points strategy! The Citi ThankYou Rewards program has a unique category that no other program offers: entertainment. So if you are one who likes to go to movies, concerts, sporting events, and other similar types of entertainment, these could be good cards for you. You can utilize the points in the Citi Travel Center (get a 25% bonus for points when you have the Citi ThankYou® Premier Card or Citi Prestige® Card), or you can transfer points to travel partners, mostly at a 1:1 ratio. If you’re using them in the travel center with the Citi ThankYou® Preferred Card, they are only worth $0.01 each. However, points get a 25% bonus ($0.0125 each) when using the other two cards (ends 9/1/19). However, points are most valuable when transferred to travel partners. An average point can be redeemed for $0.015 – $0.02 in this way, and sometimes you can get better deals. As long as you have at least one of your cards open, your points will never expire. After cancelling your last card, you will have 30 days to use them before they expire. Shared points will expire 90 days from the date they are received. What is the Citi ThankYou® Preferred Card? This is the basic, $0 annual fee version of the ThankYou Rewards card. It earns 2x points in dining and entertainment categories, and 1x points everywhere else. You can pool your points together from your other Citi ThankYou cards, and you will have better options and value for using your points when you have one of the other two cards. What is Citi ThankYou pay with points? The pay with points option allows you to pay online bills at BestBuy.com and Wonder Technologies with the points you have accumulated with your Citi reward program credit cards. How do you maximize Citi ThankYou points? To maximize the number of points you get, you should utilize sign-up bonuses (when available), as well as utilizing the credit card(s) for all travel, dining, and entertainment expenses. To learn more, check out our article on earning Citi ThankYou points. How do you redeem Citi ThankYou points? You can redeem Citi ThankYou points through CitiThankYou.com for Amazon.com, travel rewards, sharing of points, Live Nation, Home Depot, gift cards, BestBuy.com, or as statement credit on recent purchases. Redemptions can be made from the Citi ThankYou center at ThankYou.com. How do you transfer Citi ThankYou points? Points transfers are made from ThankYou.com. Log in to your account and you will see the partner transfer option, select how many points you want to transfer and complete the transfer. Points will transfer immediately, or may take up to a couple days or weeks. How do you use Citi ThankYou points on Amazon? Go to Amazon.com/Citi to sign in and link your Citi account to your Amazon account. Whenever you make a payment, you can add your Citi ThankYou card as an eligible form of payment which will connect your points balance to your account. You can use as many points as you want to offset the balance of the order.